Preheat oven to 350°. Cook lasagna noodles according to package directions; drain. Meanwhile, in a large skillet, heat butter over medium heat. Add shrimp and scallops in batches; cook 2-4 minutes or until shrimp turn pink and scallops are firm and opaque. Remove from pan. For cheese sauce, melt butter over medium heat in a large saucepan. Stir in flour until smooth; gradually whisk in milk. Bring to a boil, stirring constantly; cook and stir 1-2 minutes or until thickened. Remove from heat; stir in remaining cheese sauce ingredients. In a large bowl, combine ricotta mixture ingredients; stir in 1 cup cheese sauce. Spread 1/2 cup cheese sauce into a greased 13×9-in. baking dish. 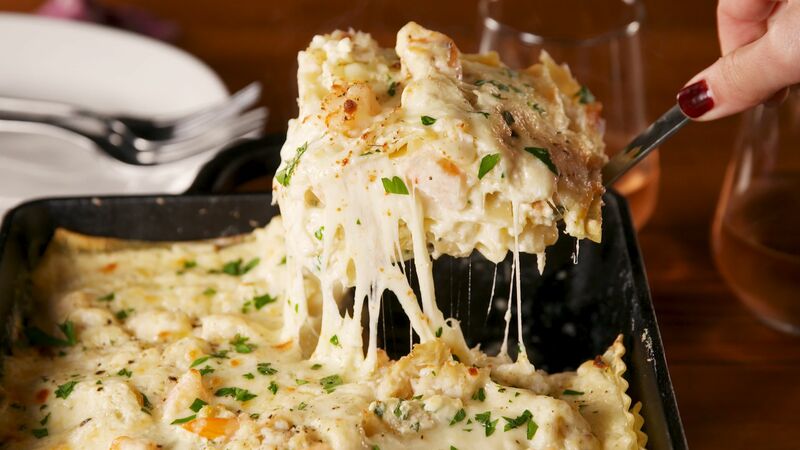 Layer with three noodles, half of the ricotta mixture, half of the seafood mixture and 2/3 cup cheese sauce. Repeat layers. Top with remaining noodles and cheese sauce. Sprinkle with remaining mozzarella cheese and Parmesan cheese. Bake, uncovered, 40-50 minutes or until bubbly and top is golden brown. Let stand 10 minutes before serving. Sprinkle with parsley. 1 piece: 448 calories, 19g fat (11g saturated fat), 158mg cholesterol, 957mg sodium, 29g carbohydrate (5g sugars, 2g fiber), 39g protein.